Much has been written about Paracelsus (1493–1541), the famous alchemist, physician, and astrologer of the sixteenth century, often cited for coining the phrase “the dose makes the poison.” Never the unpretentious type, he was born Theophrastus Philippus Aureolus Bombastus von Hohenheim in Einsiedeln, Switzerland, but changed his name to Paracelsus (meaning “greater than Celsus”) after the renowned first-century Roman encyclopedist Aulus Cornelius Celsus. Most significantly, Paracelsus pioneered the medical use of certain elements, minerals, and chemical compounds, including mercury and opium, and he conducted experiments to learn about the human body and the nature of disease. 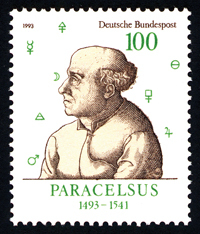 The stamp shown here was issued in Germany on 10 November 1993 to celebrate the 500th anniversary of Paracelsus’s birth. The stamp features his likeness, based on a 1538 etching attributed to Augustin Hirschvogel, a German artist and mathematician known primarily for his etchings. In addition, the stamp displays (clockwise, starting from the lower left corner) the alchemical symbols of iron, air, silver, mercury, sulfur, salt, potash, and tin, all essential tools in the alchemists’ armamentarium. Interestingly, some of these symbols were also associated with celestial bodies known at the time, such as Mars (iron), the Moon (silver), and Jupiter (tin). Written by Daniel Rabinovich <drabinov@email.uncc.edu>.